Reviews, tech news and how-to articles. 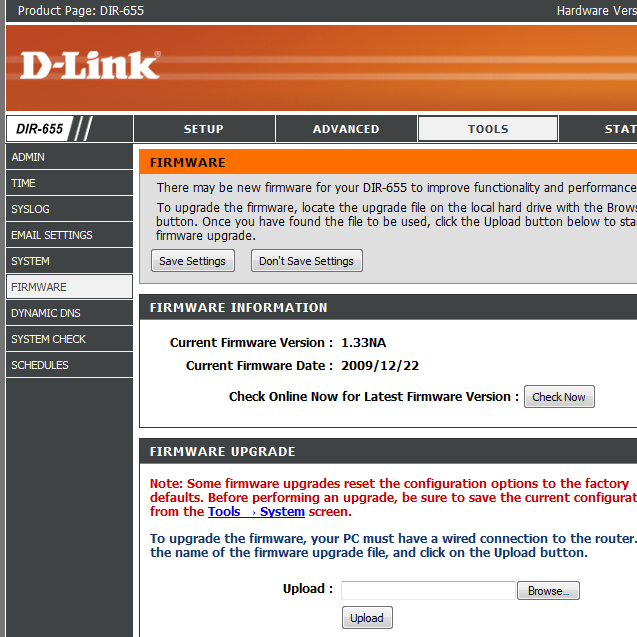 D-Link have been quick to release new versions of the 1.33NA firmware recently, now they have released the final 1.33NA version. Remember this cannot be downgraded by official means to anything pre-1.3x or other international firmwares, however you can always try the unofficial way. Works well with XP and OS X 10.6.. Shareport works well with printer. Admin login with password only worked from XP IE for some reason. I have a problem with 1.33NA firmware (I hope it’s not with the hardware). I just added some port forwards, rebooted the device for effects to take place and now the router reboots every 2-3 minutes. No problems before. will try to undo the mpodifications and see what happenes. Anyone else have these problems? Nope, seems to be rebooting now even without those port forwards. Try resetting the router back to factory defaults, it may clear whatever is causing the problem and allow you to re-add the port forwards without issue. Thankfully now, the day after the incident, everything seems to have gone back to normal. No more reboots. I did change the pppoe password though. Maybe it was just the fact that i had a lot of p2p connections and the router couldn’t handle it. Ahhh, just glad it’s back, I thought for a moment that iI had to buy another router or send this one to be fixed…. My router has been hanging more since upgrading, too (requires it to be unplugged). It seems to happen a lot when playing Bad Company 2. I haven’t tried reseting to the defaults, like someone mentioned up above.